Where do we come from? What is the universe made of? Will the universe exist only for a finite time or will it last forever? 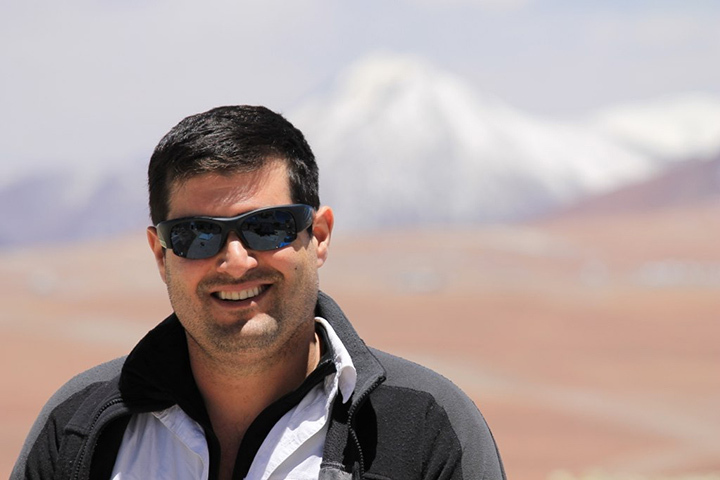 These are just some of the questions that University of California, San Diego physicists are working to answer in the high desert of northern Chile. Armed with a massive 3.5 meter (11.5 foot) diameter telescope designed to measure space-time fluctuations produced immediately after the Big Bang, the research team will soon be one step closer to understanding the origin of the universe. The Simons Foundation has recently awarded the team a $4.3 million grant to build and install two more telescopes. Together, the three telescopes will be known as the Simons Array. “The Simons Array will inform our knowledge of the universe in a completely new way,” said Brian Keating, associate professor of Physics at UC San Diego’s Center for Astrophysics and Space Sciences. Keating will lead the project with Professor Adrian Lee of UC Berkeley. Fluctuations in space-time, also known as “gravitational waves,” are gravitational perturbations that propagate at the speed of light and can penetrate “through” matter, like an x-ray. The gravitational waves are thought to have imprinted the “primordial soup” of matter and photons that later coalesced to become gases, stars and galaxies—all the structures that we now see. The photons left over from the Big Bang will be captured by the telescopes to give scientists a unique view back to the universe’s beginning. The telescopes of the Simons Array—named in recognition of the grant—will focus light onto more than 20,000 detectors, each of which must be cooled nearly to absolute zero. The result will provide an unmatched combination of sensitivity, frequency coverage and sky coverage. 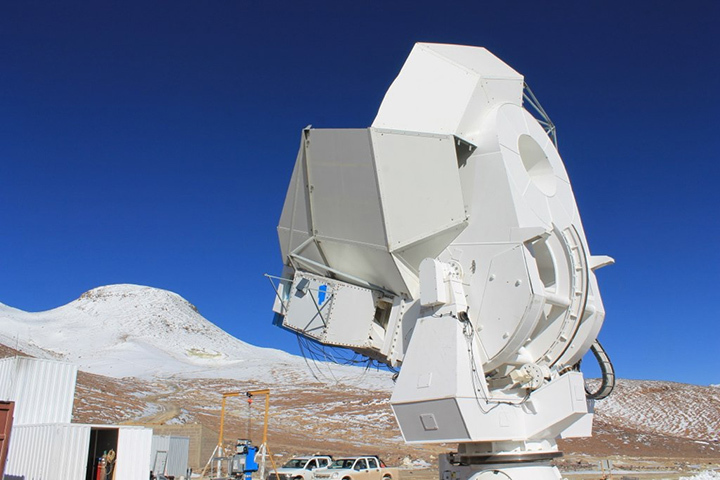 Last year, the first POLARBEAR (for Polarization of Background Radiation) telescope, which will comprise one third of the Simons Array, was set up in Chile’s Atacama Desert. The site is one of the highest and driest places on Earth at 17,000 feet above sea level, making it one of the planet’s best locations for such a study. The site’s high elevation means that it lies above half of the Earth’s atmosphere. Because water vapor absorbs microwaves, the dry climate allows the already thin atmosphere to transmit even more of the faint cosmic microwave background radiation. Since March 2012, the telescope has recorded data to identify an imprint of primordial gravitational waves on the cosmic microwave background radiation, the relic radiation remaining from the Big Bang. While POLARBEAR was a major technological achievement, the single telescope is sensitive to just one frequency. Additional detectors in the new telescopes will measure the cosmic microwave background at different frequencies so that researchers can compare the data and subtract out contaminating radiation emitted from the Milky Way Galaxy. Together, the three telescopes will also be much more sensitive to the elusive gravitational wave signals, offering deeper insight into the origin of the universe. Scientists from UC San Diego, UC Berkeley, Lawrence Berkeley National Laboratory, University of Colorado, McGill University in Canada and the KEK Laboratory in Japan are collaborating on the project. Based in New York City, the Simons Foundation was established in 1994 by Jim and Marilyn Simons. The foundation’s mission is to advance the frontiers of research in mathematics and the basic sciences. The Foundation is delighted to be able to help support this innovative investigation into the earliest moments of the universe. Initial funding for the first POLARBEAR telescope came from the National Science Foundation, the James B. Ax Family Foundation and an anonymous donor. For more information on the Simons Array, visit cosmology.ucsd.edu. More information on the Simons Foundation can be found at simonsfoundation.org.